Barbara Maher is an award-winning cookbook author who was born in Germany and brought up in England. She is fluent in German, French and Italian which allows her to conduct extensive research in a wide range of international cookbooks dating back to the fifteenth century. This is an amazing cookbook because it also includes a wide variety of cakes that you might not have heard of in an English/American cookbook. This book is a collection of the world's finest cakes. There are such divine cakes in this cookbook, you will be seduced by lavishness. 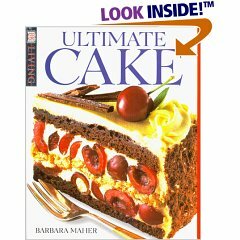 Not only are there full-color pictures displaying a bakeryful of tempting tastes, there are more than 100 recipes for cakes and desserts for every occasion. If you are looking for a light, airy treat for an afternoon snack you might choose lacy Florentines. If you are new to making some of the cakes, there are easy-to-follow photographic sequences that demonstrate every essential baking and decorating technique. Whether you want to know how to pipe rosettes or sugar-frost flowers, it is all explained in pictures. You can find recipes for: Luxury Layer Cakes, Chocolate Cakes, Cheesecakes, Flans & Tarts, Meringues, Fruit & Nut Cakes, Pastries & Cookies, Wedding Cakes, Children's Party Cakes, Butter Cakes, Sponge Cakes, Nut & Seed Cakes. There is an entire section on key ingredients and equipment used in cake making. This is the section where you can see all the basic skills required for baking. Basic ingredients are pictured. There are also "enriching" ingredients. The "bakeware" section is helpful because at times you can read "Balmoral pan" and have no idea what that is. I had never seen one myself. I liked the "variations" on the butter Cakes recipe. You can chose to make a simple butter cake or turn it into a chocolate marble pound cake, a mixed spice pound cake or a fresh apricot pound cake which actually looks the best with icing dripping all over it. I had never thought of using green grapes to decorate a cake. It is such a fresh beautiful idea. How about fresh cherries, mint leaves and chocolate curls? Fruit & Spice Cakes - could make a beautiful Christmas Gift that would not be soon forgotten. Chocolate Eclairs, Buche de Noel and Italian Easter Cake look divine. Delicious Yummy Cakes that you will definitely want to make! If you love making your own bread at home in the bread machine or by hand, this 10-Grain Baking Blend is bound to impress. You can add a few tablespoons to your bread recipes to add to the nutritional value. 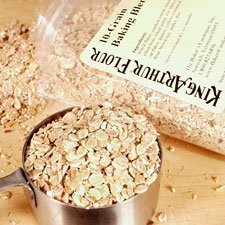 Ingredients: Organic wheat flakes, organic cracked wheat, white wheat bran, wheat germ, organic rye flakes, organic yellow cornmeal, organic whole grain barley flakes, organic whole grain quinoa, organic thick oat flakes, low-fat soy flour, short brown rice, organic hulled millet and brown flaxseed. I used this tonight and the results were impressive. My husband couldn't wait to get a slice of bread. Other ingredients you might want to look for include: instant yeast, all-purpose flour, mild molasses, wheat germ, thick rolled oats, yellow cornmeal and pumpernickel flour. By making bread at home, you can have hot bread from the oven in no time and everyone is happy. There is a definite comfort factor when making breads at home. With this 10-Grain Baking Blend, you can create many new recipes that will enhance your family's health. You could add this to pancakes, scones, homemade granola, muffins, cookies and an entire list of baked goods. Many people have peanut or nut allergies and eating pumpkin seeds may be a good alternative and delicious solution. These are also a good substitute for almond or hazelnut praline in your chocolate truffle or candy recipes. You can add these to bread dough, trail mix, chocolate chip cookie dough or even scones and muffin batters. Ingredients: Sugar, pumpkin seeds, spice, salt and caramel color. 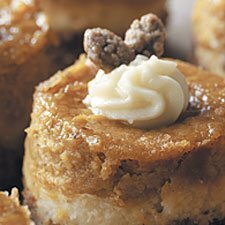 The taste is similar to a pumpkin pie spice, with cinnamon as the featured spice element. If you plan on sharing these or baking, you may want to order two bags. 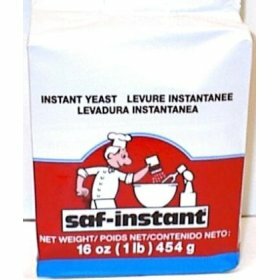 If you love using your bread machine and want a reliable yeast that does not need to be proofed (can't remember the last time I did that), then this yeast will make your life much easier. While this is not a rapid yeast, the bread does seem to rise more quickly than with packets of yeast from the grocery store. This saves time and gives you an empowered feeling instead of the "Is this going to rise or not?" feeling. Delicate and crunchy buttery shortbread cookies have been rolled in raspberry flavored confectioners' sugar. You might want to buy two tins because these will be gone in a "snap." Otherwise, they do sort of snap as you bite into them and they have an intriguing crunchy textures that is also buttery and especially delicious. Perfect for tea parties, as a gift or to savor as a personal indulgence. Ingredients: flour, cornstarch, powdered sugar, butter, margarine, vanilla, salt and raspberry juice. 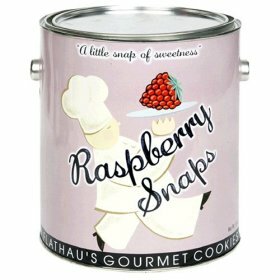 The high-quality tin makes this very gourmet and the raspberry cookies would go very well with a raspberry tea.